Reach out for more in the sunny realm of the Philippines by island hopping in this country, known to be the 64th largest country in the world. Called a middle power due to the nation’s large population and economic potential, and being the world’s second largest archipelago, the Philippines is naturally the dream destination of all island hopping enthusiasts out there. #1 - Malapascua Island: Located just off the north tip of Cebu Island, Malapascua Island is the favorite destination of divers. Its Monad Shoal was called number 11 out of the top 101 dive sites in the world according to the Asian Diver magazine. Furthermore, what make this delightful island really popular are its daily thresher shark sightings, which are very rarely seen by divers. These sharks look absolutely gorgeous with their long tail that is half the size of their body. #2 - Siargao Island: Situated 800 kilometers southeast of Manila, Siargao Island is found in the province of Surigao del Norte. Tourists can go there via Cebu Pacific Airlines that flies direct to Siargao Island from Cebu. This charming island, on top of being known as the “Surfing Capital of the Philippines”, also has other great activities to offer other than surfing. The friendly people, the food, and the beaches are awesome too! Go island hopping with your family and friends there as well, by visiting Naked Island, Daku Island and Guyam Island. 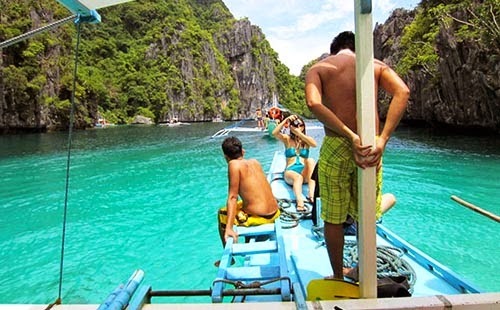 #3 - Palawan Island: Lying in between South China Sea and Sulu Sea, the Palawan Islands stretch from Mindoro to Borneo. Its base camps for island –hopping are El Nido and Coron Town, while tourists can enjoy snorkeling and diving also, in the Bacuit archipelago and Calamianes Group of Islands. Bask in the summer sun of this largest and very beautiful province in the Philippines now! #4 - Romblon Island: An archipelago province of the Philippines, Romblon is composed of the following islands: Tablas (largest), Sibuyan, Corcuera, Banton, Concepcion, San Jose and Romblon (its capital). The people of Romblon are known to be very kind, and their province is actually a small island with just a handful of great resorts, food stores and activities if you would like to relax for a few days. #5 - Mactan Island: As the Philippines' most densely populated island, Mactan is located near Cebu Island and is part of Cebu province. It is 65 square kilometers huge and has about 430,000 residents. Enjoy island hopping with your group and snorkel with tropical fish there. You’ll be riding a ‘banca’ or motorized canoe as you cruise through the islands. Many more thrilling things are in store for you at Mactan Island. #6 - Caramoan Peninsula: Located north-east of Camarines Sur, in Bicol, Caramoan is a hilly peninsula which is famous for its Caramoan National Park and their Green Racket – tail—an important bird with the scientific name, prioniturus luconensis. The Caramoan National Park houses caves, limestone formations, white sandy beaches, a lake and river, which are all-time favorites of tourists who flock to this peninsula. #7 - Guimaras Island: Situated in Western Visayas, Guimaras, which used to be part of Iloilo province, is one of the smallest provinces in the Philippines, with Jordan as its capital. It is comprised of the islands of Guimaras, Inampulugan, Guiwanon, Panobolon, Natunga, Nadulao and many other smaller islands. Small but terrible with their heavenly sweet mangoes, Guimaras is also such a spectacular island to unwind and experience biking, swimming, island hopping, trekking, rappelling, target shooting, etc. #8 - Boracay Island: Indulge in pleasure in Boracay Island, a paradise fit to be called the Philippines’ prime tourist destination. Fly fast to this relaxation haven, from Manila to Caticlan Airport in Panay Island. You can also take the Manila – Kalibo flight, and then take a 1.5 hours bus trip to Caticlan. From Cebu City, fly to Caticlan or Kalibo for about 30-50 minutes from Tablas, Romblon. #9 - Siquijor Island: Found in Central Visayas, Siquijor is an island province which is bounded on its northwest by Cebu and Negros and to the northeast by Bohol. It is the third smallest province in the Philippines and is known for its mystic traditions upon which the province centers its growing tourism industry. You can reach Siquijor Island by sea travel on a craft from Cebu (5 hours) or Dumaguete (45 minutes). #10 - Dakak Island: Being the first five-star resort in Mindanao, with a Triple A accreditation from the Department of Tourism, Dakak Park and Beach Resort is located along a private 750 – meter white sand and beach. Astonishingly eluding the typhoon belt, it is thus an all-season travel mecca at Taguilon, Dapitan City, Zamboanga Del Norte. Savor its island, fishpond, historical tours, etc. which will absolutely keep you operating at your most cheerful level. Don’t get bored, let’s hop aboard!